The positive identification of wooden aircraft propellers can be frustrating, time consuming, and often very difficult. Positive identification of usage is made by correlation with a drawing number (also called design number, serie no., etc.) that was stamped on the propeller at the time of manufacture. There were literally thousands of different models and designs even as early as WW1, and many newer designs were added after that. It is convenient to try to categorize them into one of two categories, "Early" and "Modern". Early propellers are those designed and manufactured for aircraft engines prior to the advent of metal propellers. This generally encompasses a time frame that included World War One and earlier. All later propellers are classified as Modern. Shortly after the War, engine technology and propeller technology rapidly accelerated, and wooden propellers were quickly replaced by metal propellers operating at higher RPM's. And most wooden propellers that continued in production had a more characteristic design like that seen on the right, below. In the collectibles market, Modern propellers seem to far outnumber Early propellers by almost 10 to 1. Please do not email me with identification or valuation questions. Here's why. Below are some of the general characteristics of each category. Scoll to the bottom of the page to view "other" wooden propellers. Darker woods, typically mahogany, walnut, oak, cherry. Offset blade patterns, often scimitar with variations in leading edge and trailing edge curves. Exposed or fabric covered tips, painted. Some copper or other malleable sheathing towards tips. Drawing number or engine data stamped on hub. Click on Photo Gallery for thumbnails of a variety of WW1 propellers. Post a question on the Wooden Propeller Forum under "Early Propellers" if you need help. Usually 6 to 8 feet in length (associated with higher RPM engines, usually above 2000 range). Often 6 bolt holes, sometimes 8. Light colored woods, usually ash, birch, maple, etc. Symmetrical blade design, with leading and trailing edges similar, as in above photo. Thin metal along leading edge towards hub. Fabric on tips common. Design number often on base of blade, or on hub. If you think yours is in this category, go right to the Modern Wooden Propellers web site. For variable pitch (multiple blades) propellers click here. Not all wooden propellers were used to power aircraft. Some of the other alternatives are listed below. Airboat Propellers - Commonly mistaken for aircraft propellers, airboat and snowsled propellers typically have broad, flat pitched blades with squared off tips. Bolt holes are often larger (i.e. 1/2") than aircraft hubs. UAV Propellers - Small size, usually under 48 inches or less, these often have red painted tips. 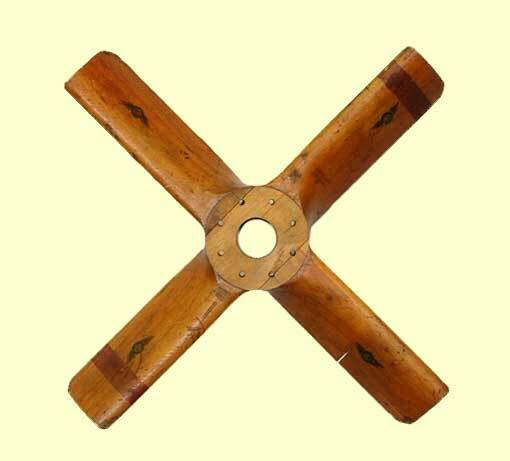 Auxilliary Propellers - These are small and the design and number of blades vary widely. They are difficult identify. Ultralight Propellers - These are very simillar to certificated aircraft propellers but usually under 6 feet, having a 4 or 6 hole bolt pattern, and rarely having metal sheathing or even fabric tips. Test Club Propellers - These propellers are used for ground testing aircraft engines. Unlike service propellers, they have a constant angle of the blade from the hub to the tip. Blades are typically short and stubby, as depicted on left.